Explore and epic world filled with untold obstacles and shadowy foes! With Dr. Eggman defeated, Sonic's world is at peace... until a mysterious menace kidnaps Knuckles. 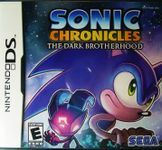 Sonic must band with 10 others using teamwork and strategy to combat the Dark Brotherhood.